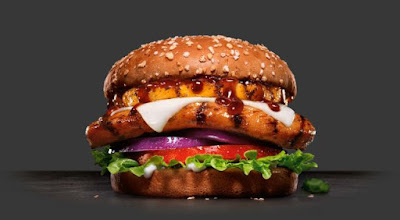 Carl's Jr. and Hardee's are grilling up chicken filets with "no antibiotics ever" as an attempt to offer better grilled chicken across their line of Charbroiled Chicken sandwiches. As part of the revamp, they've also introduced the "new" Charbroiled Hawaiian Chicken Sandwich. Available for a limited time, the Charbroiled Hawaiian Chicken Sandwich features a "no antibiotic ever" charbroiled chicken breast filet, grilled pineapples, teriyaki sauce, Swiss cheese, red onion, lettuce, and tomato on a toasted honey wheat bun. If the description sounds somewhat familiar, it got some run as the Teriyaki Chicken Sandwich at Carl's Jr. and as the Hawaiian Chicken Sandwich over the years.